I chose this car as this week's car of the week simply because it turned heads and got a lot of attention while it was here.. no other reason! 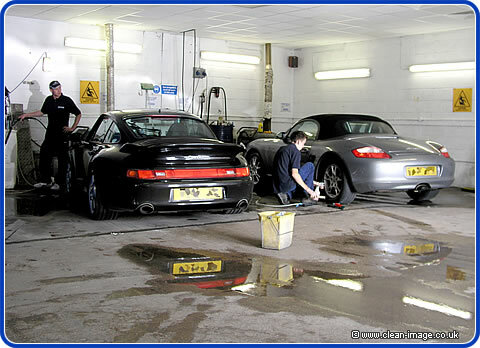 It had paintwork correction and a Diamondbrite paint sealant - the work was carried out by Mark so it was mostly in his valet bay near the front of the building where everybody could see it. I think that most people who came into Clean Image while it was here wandered over for a closer look. Paintwork correction would normally be £500, but in return for getting the car valued we gave the customer £200 cash back as part of our special promotion this month. 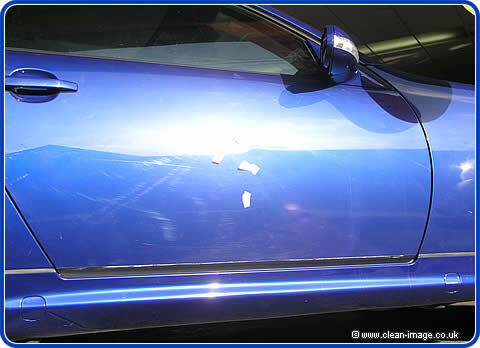 The paintwork was a normal base without a clear-coat and had become dull, oxidized, scratched and stained. Mark was able to make the paintwork glow like new, the paintwork correction not only removed the swirl marks but also brought back the brightness and warmth to the colour. The car was valued before and after and it was found that our work increased the value of the car by £2000, that's pretty good when you think the customers bill was £500 including his sealant. See! 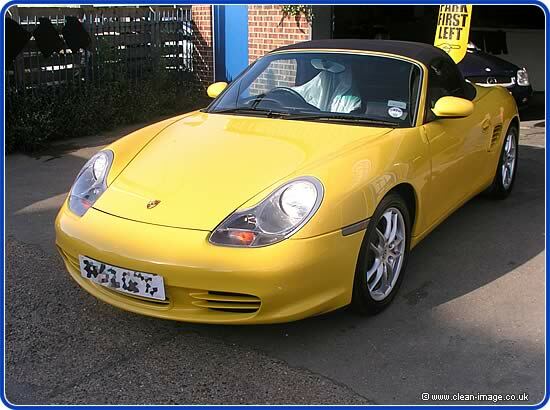 We told you that valeting pays you back, this very pleased Porsche owner made a profit of £1500. This was a completely independent valuation that the customer organized himself with The Carriage Company Ltd.
We did a similar type job on this Mercedes SLK. This car was about 6 years old and required more work, including dent removal (some of the dents are marked by bits of tape in the photo below), paint correction, some interior repairs and we also had the roof repainted to cover a key scratch and a couple of rust blisters. This car was also valued before and after and was found to be worth £2000+ more after we had carried out the work. This car had had a respray ar some point which was quite noticeable to anybody taking a close look (for example if they were buying the car) which would have made the car quite difficult to sell, especially with the rust blisters on the roof. Having the roof repainted and correcting the paintwork made the car infinitely better to look at. And the repairs to the leather and trim made the interior immaculate. The customer had no intention of selling this car but with the work done and a paint sealant applied, this car was good for many years to come. I should also not that this customer drove down to us from Scotland! Ah yes! I remember it well, because we had a honda in which had just about the most horrific swirl marks I have ever seen (in this country anyway). I managed to take pictures before paint correction, and during paint correction, but I was off sick the next day and didn't manage to take pictures after which still keeps me awake at night, because I did see the completed car and it was fantastic, probably one of the best jobs Mark ever done. 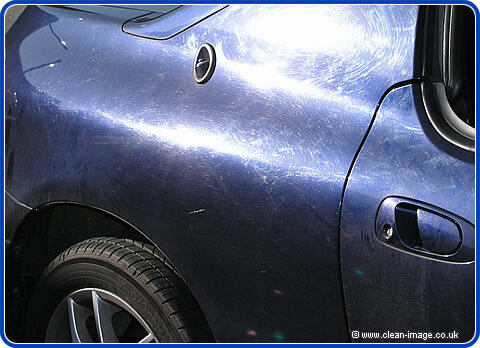 So that would have been my car of the week, and probably my choice for car of 2005, but without the photos.. all I can do is show you a picture which illustrates what we mean by 'swirl marks'. So instead I'll make this Volvo car of the week. Why the Volvo? 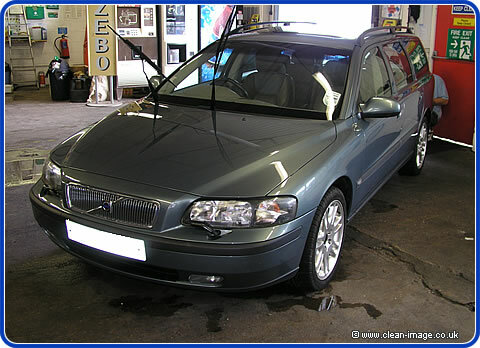 Well because I have been looking for a decent photo of a Volvo that I have valeted for a bit of a competition! British Valeters is a website where us professional valeted can get together and exchange information -- and have a bit of a laugh! 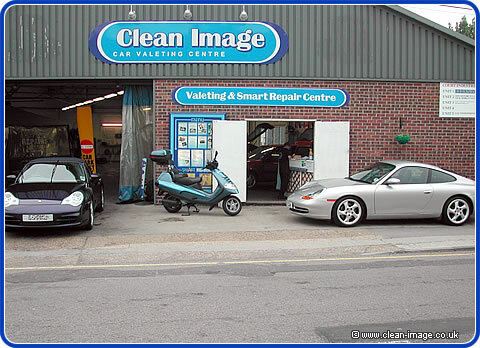 They have a gallery where you can send in photos of cars you have done and there is a bit of rivalry as to who has valeted the most different kinds of cars, and for some reason I was short of a Saab, Skoda, Rover and Volvo. Now I can cross the latter off my list! This week two yeas ago I took the picture above because we had two Porsches in at the same time! 2 Porsches? No, there is another in the car park which makes 3. But please don't think we only do two seater sports cars, the Volvo pictures above goes to prove we do plenty of family cars too.